Left New River at 8.15 for the short run Beaufort (pronounced “B’yoo Fort”) of some 22 miles as the crow flys but more like 35 miles after the meandering track is taken. Interestly there is a Beaufort in North Carolina named after the same guy but pronounced “Bow fort” which is how I would have pronounced it but they speak different around here. This voyage is very different to last years circumnavigation of Australia when we set the autopilot and checked things every half hour. 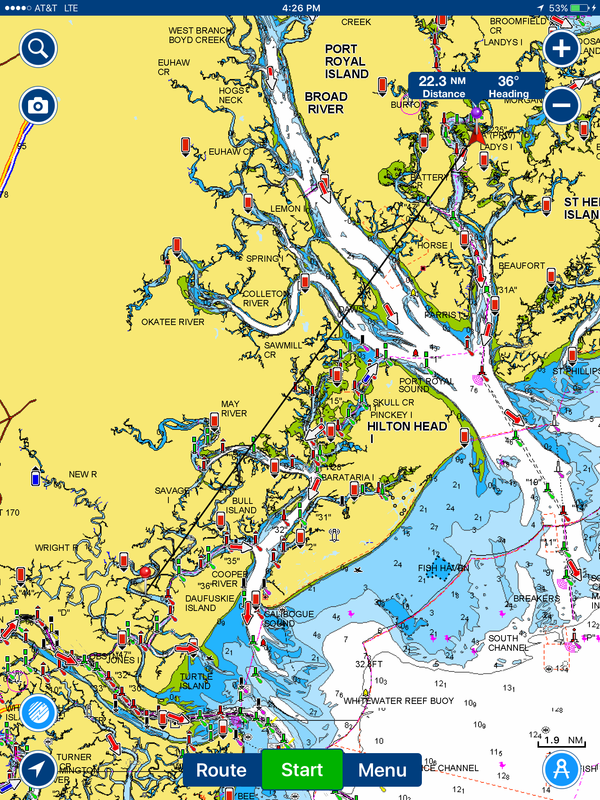 This trip requires consistent pilotage, concentration on channel markers which change whether you are in an estuary or the ICW and reversed from Australia and the rest of the world. There is a virtual labyrinth of tributaries and offshoots for you to decide which is the right one to take. You keep a constant eye on the depth as it can be easy to run aground as we fortunately avoided at Fernandina Beach. We have decided that two hours of this level of concentration is enough before swapping drivers. 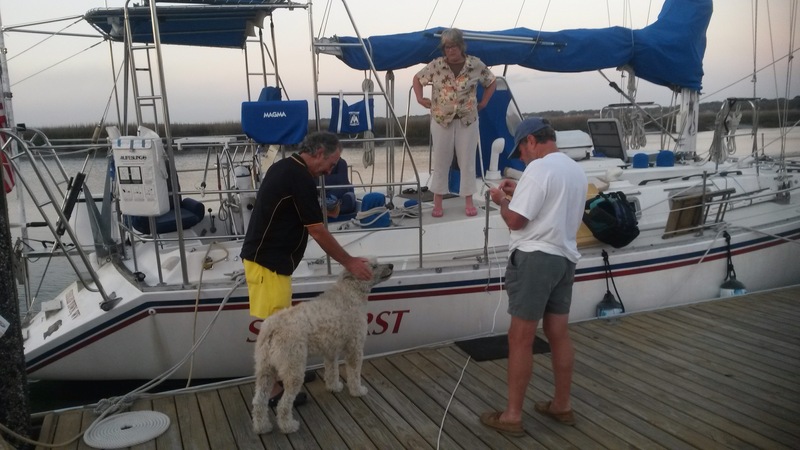 But the rewards make it all worthwhile, great management here at Lady’s Island Marina, Steve and Gloria, who brought their resident Aussie to welcome us when we moored. Barry doesn’t sound so much like an Aussie as he has been here 30 years. An accomplished author who writes under the name Neil Barry. 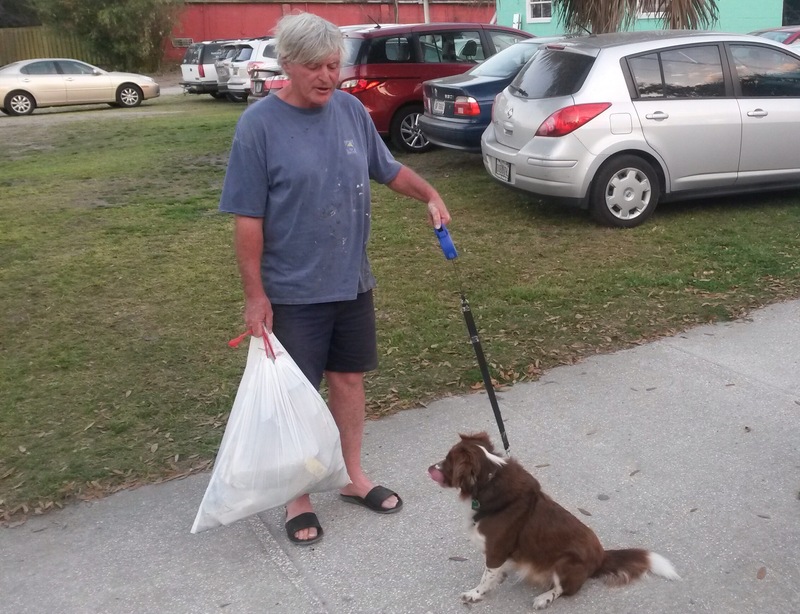 Here he is with his dog Sienna. We were loaned the courtesy car to do our shopping and then laundry and showers. Sundowners initially at the Fillin Station and then to Dovkside where we met our neighbors Steve And Denise from the sailing vessel Sunburst. Their dog Dom, short for Dom Perignom lives onboard with them. We are now 370 miles from out starting point in Hontoon Island near Deland. About 70 miles south of Charleston.